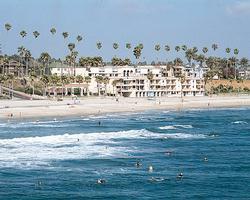 Southern California Beach Club resales, save 50% or more, golf vacations, timeshare resales. *Two weeks over New Years in the same unit. What a great way to start the year. Buy one or both. Buy both and you pay only one closing cost fee. Southern California Beach Club is a "family-style" resort nestled on the beach, just a block from the Southland's longest pier and a mile from its harbor. The resort is a short drive from many shops and restaurants and is conveniently located close to many diversions:45 minutes from the San Diego Zoo, SeaWorld, and Wild Animal Park and about an hour from Disneyland, Knotts Berry Farm, and Universal Studios. Also available are boating, fishing, outdoor activities, and professional sports year-round. After a full day, you can also savor the ocean view from the Club's rooftop whirlpool.